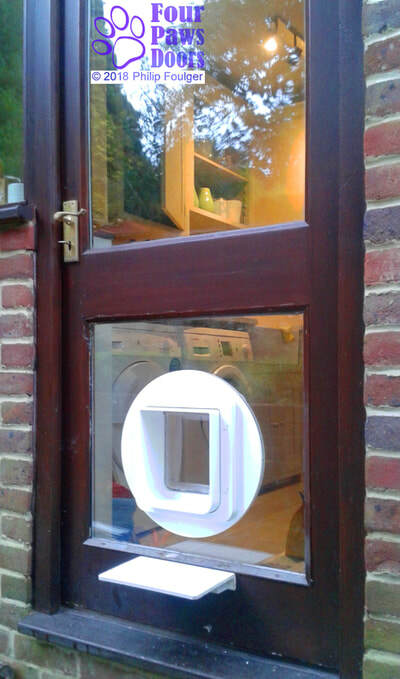 Ugly use of sealant to fill the gap behind the cat flap. 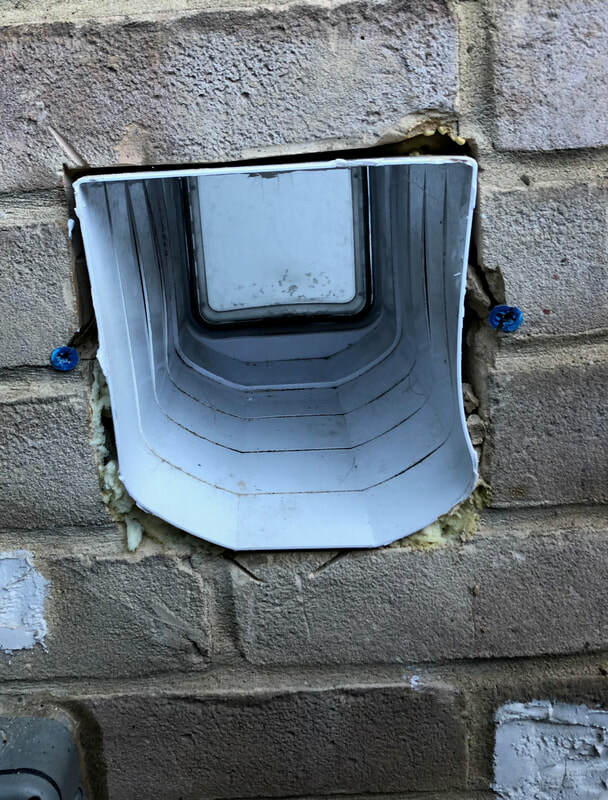 Gaps hidden behind duct tape! 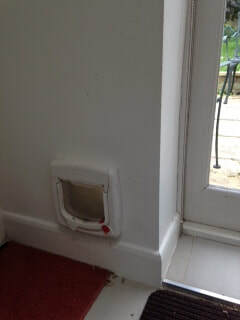 The SureFlap would be better located for the cat just above the skirting board. Wooden liner is not properly aligned with the cat flap. 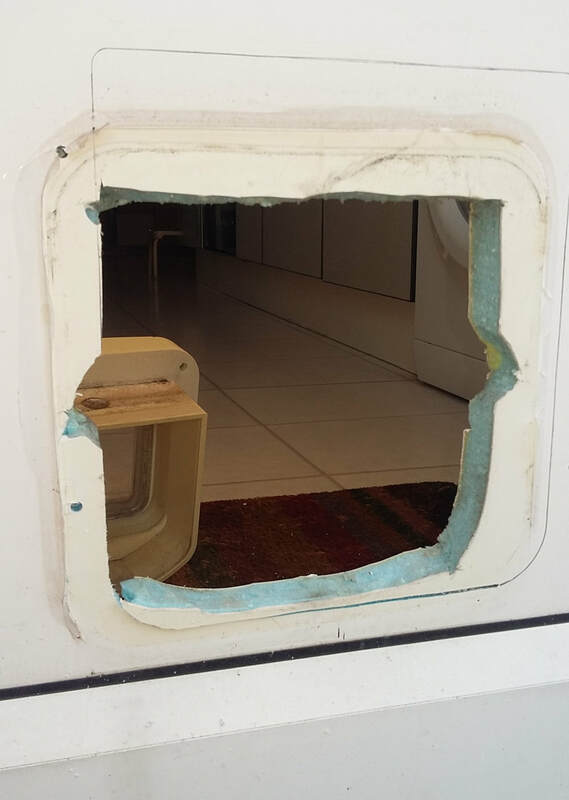 Area of uneven plaster to right of cat flap is probably over-cut that has been roughly patched up. Foam filler which exuded between joints was not cleaned up, and the joint was not sealed. 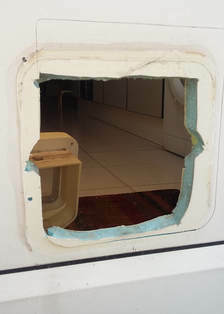 Chip board used to cover excessive over-cut of hole. 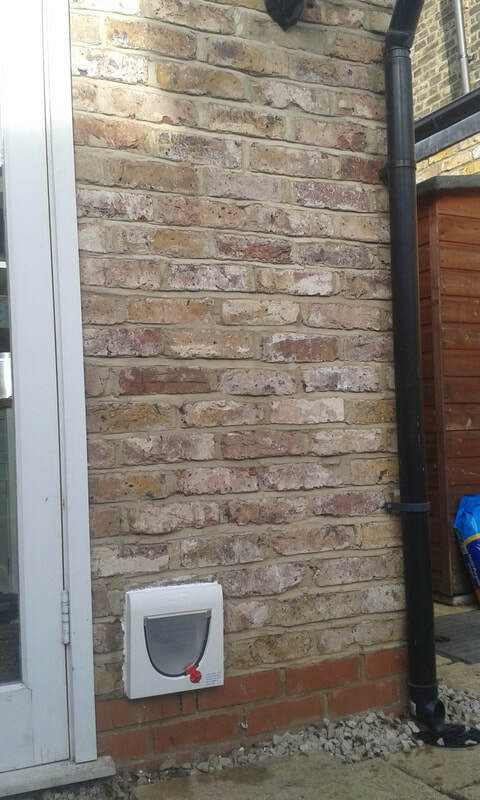 White surface salts (efflorescence) indicate dampness in the wall due to rain penetration. Appalling over-cut of hole through wall revealed. 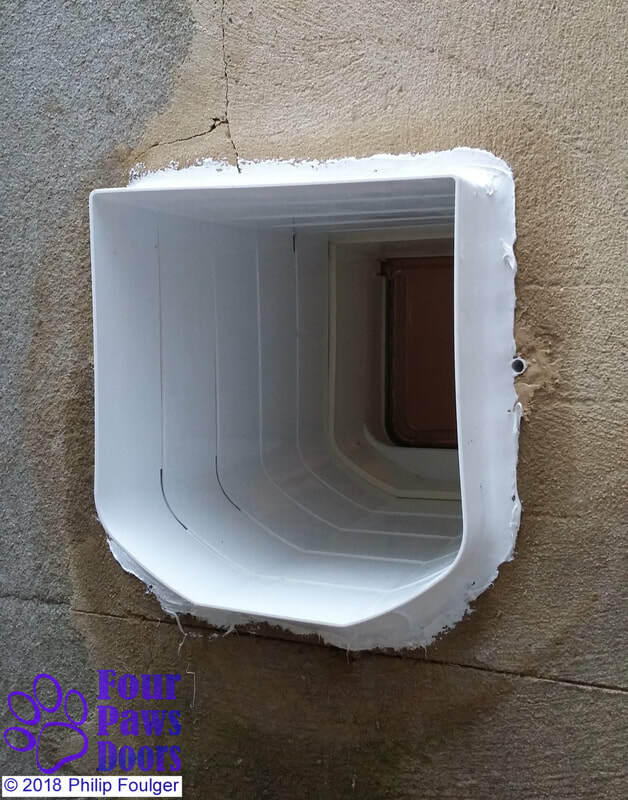 This was only partially filled with foam filler. 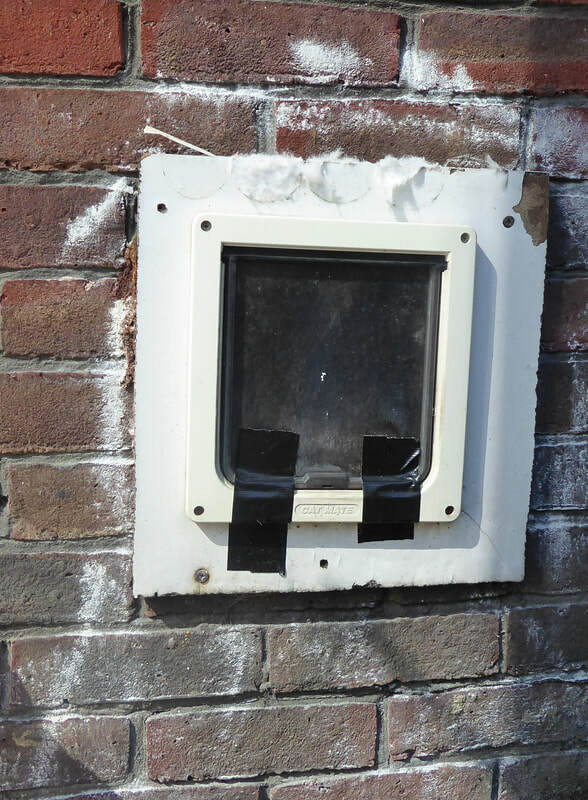 Long term solution using solid polycarbonate sheet sealed against wall. 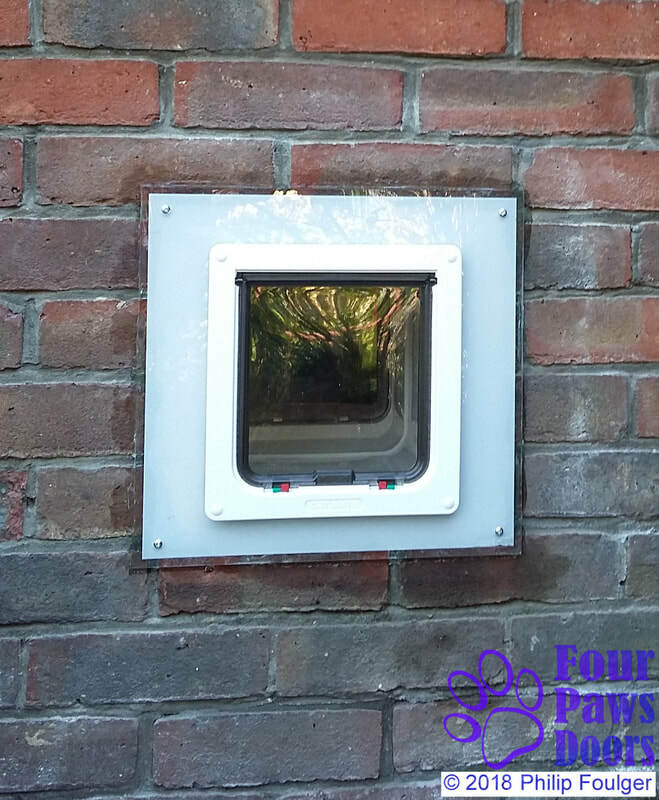 New plastic lining formed of SureFlap tunnel extenders sealed to polycarbonate. 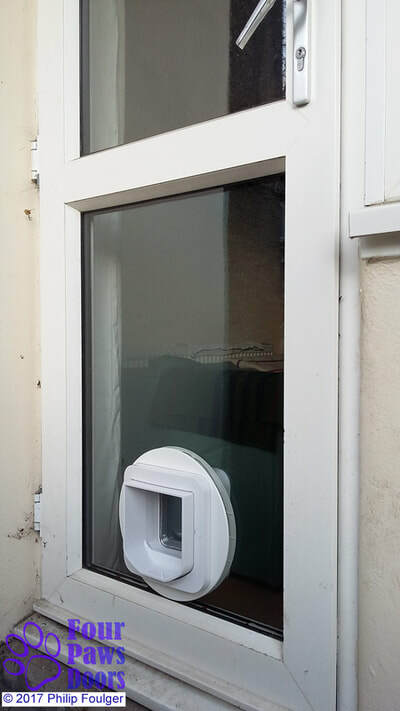 New SureFlap microchip Pet Door fitted. 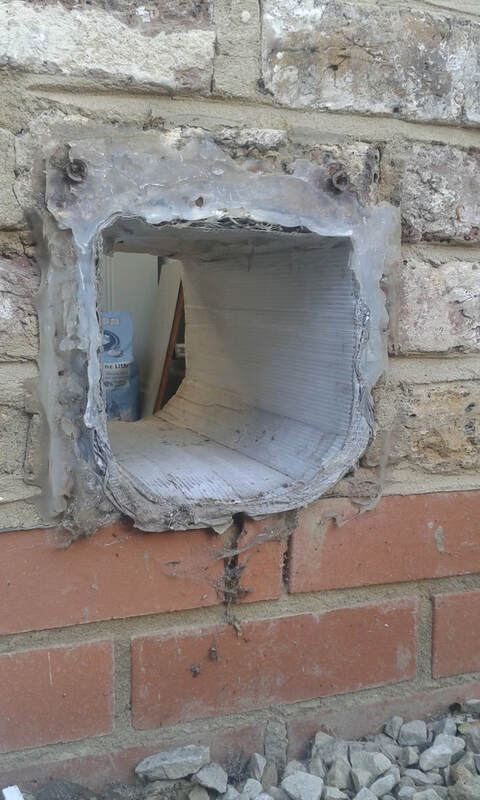 Loose plaster filled in ready for painting. 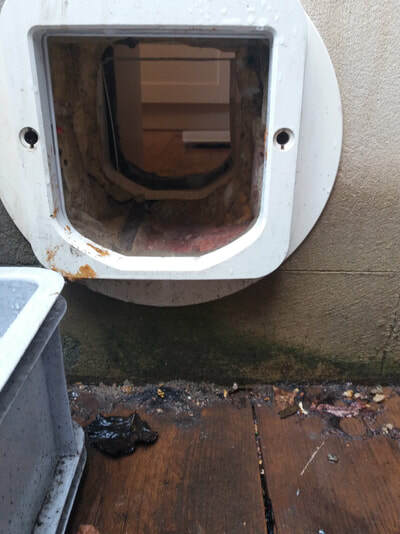 Attached are the pictures as requested, as you can see it needs completely replacing including the tunnel as it's very messy, especially from inside & possibly not entirely waterproof! 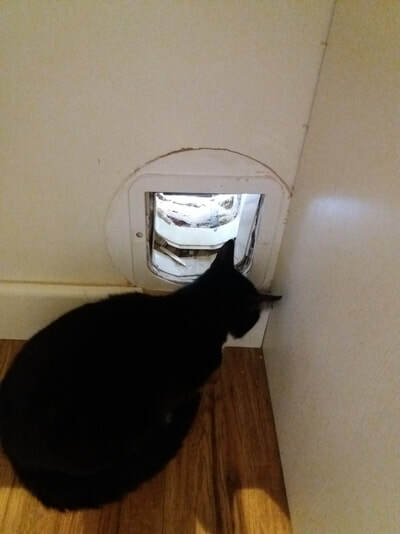 It is currently a Catmate in/out standard flap. Just got home & wanted to say thanks for an amazing job, it looks so much better! 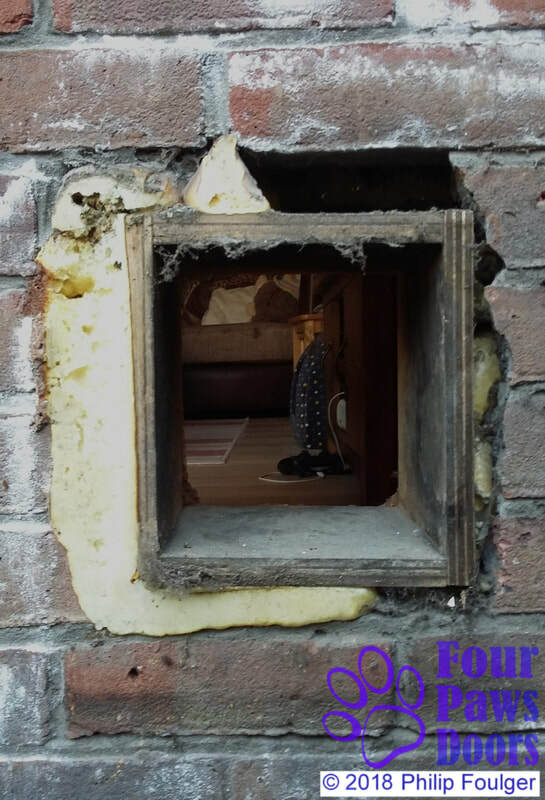 We will be sure to leave good feedback on your site. Not a credit to the cat flap fitting trade! 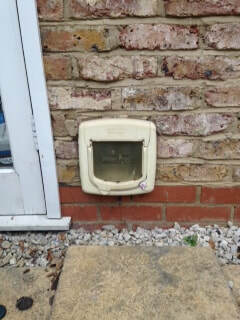 This is the hole cut for a cat flap by a specialist cat flap fitter. 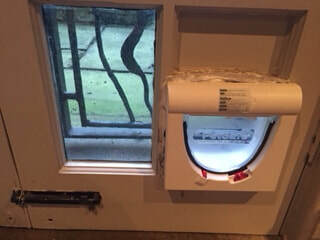 On the plus side, I expect installation was carried out in very little time! 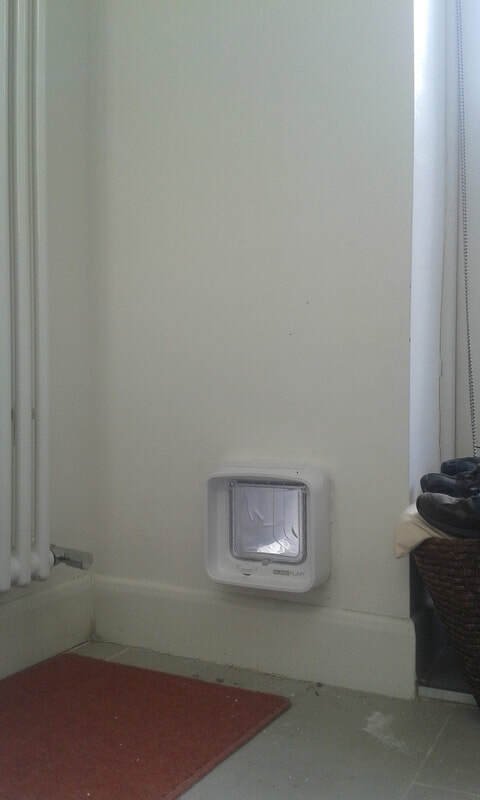 Wall access hazardous to cats. One cat was injured coming through. 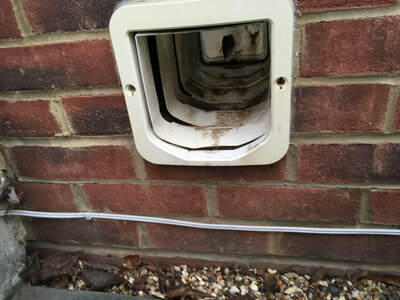 Outer frame loose and tunnel units missing. 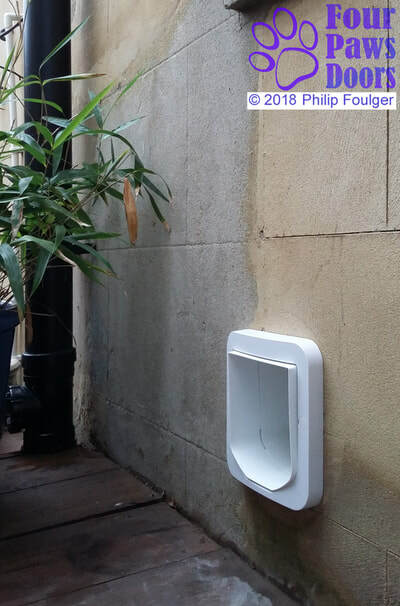 Wall exposed to the rain. 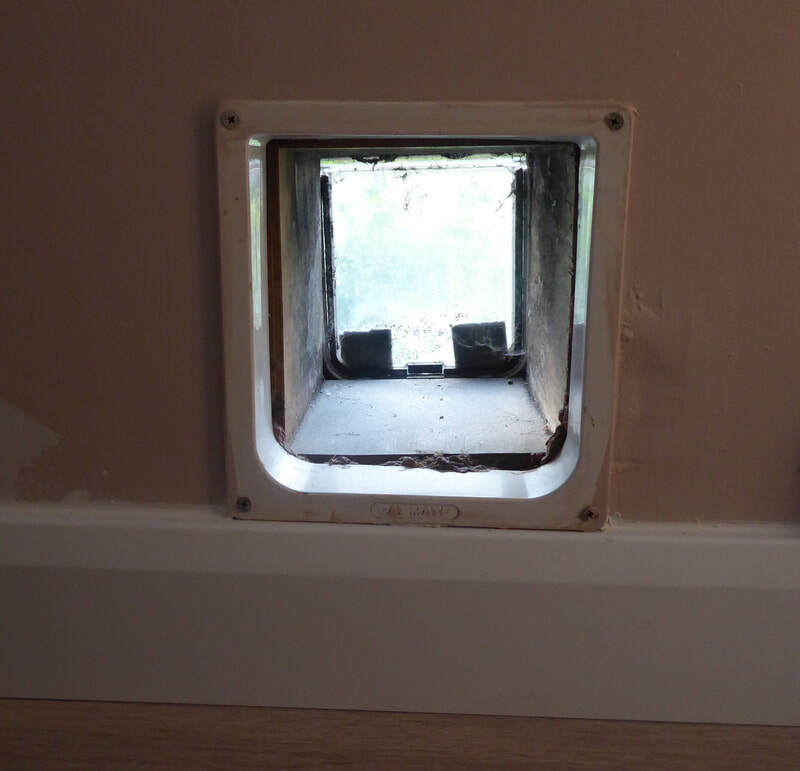 Indoor view: Removal of circular plastic adaptor reveals untidy work. 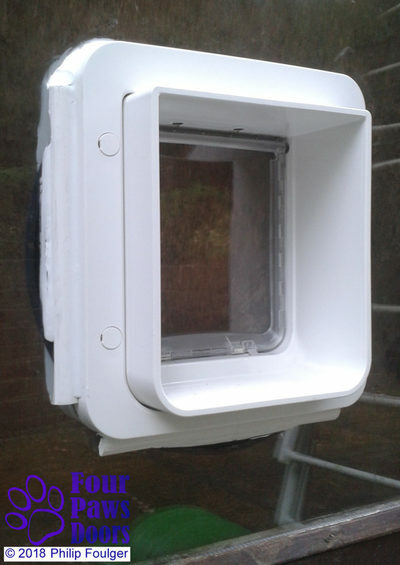 Outdoor view: Circular adaptor removed again reveals untidy work. 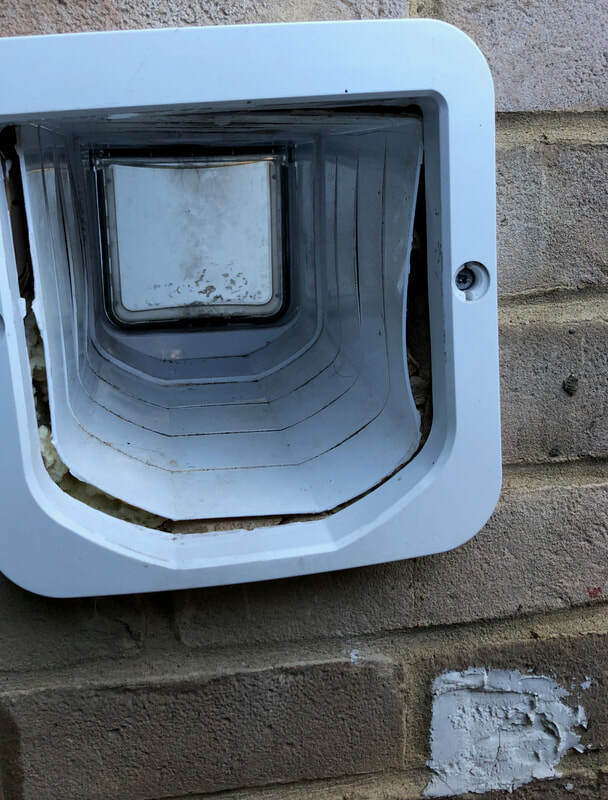 There isn't a flap at the outer wall, only the frame, which has slipped out of place, the screws aren't attaching to anything. 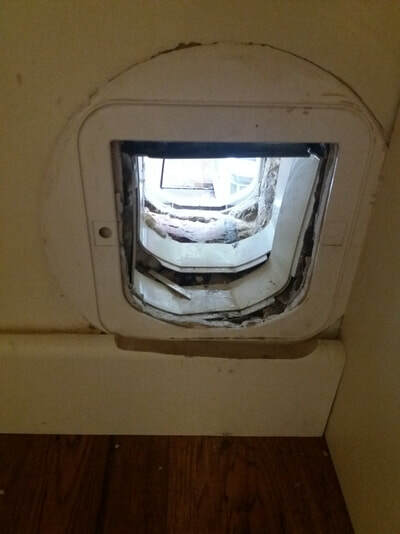 As you can see, the inner flap fitting has fallen out completely. 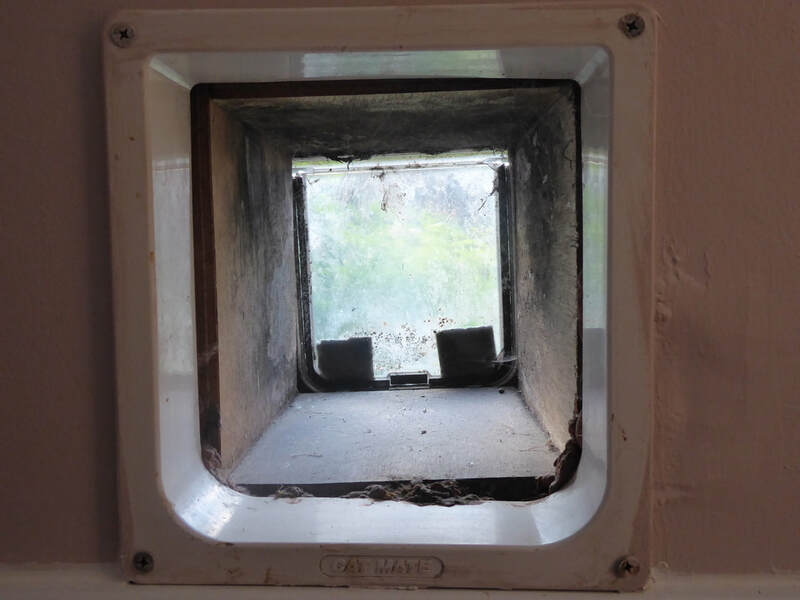 The tunnel looks very ragged as it's not lined. 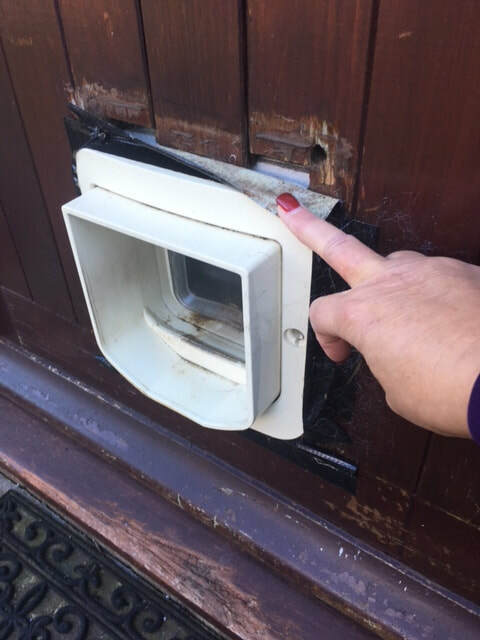 I have two cats, both micro-chipped. 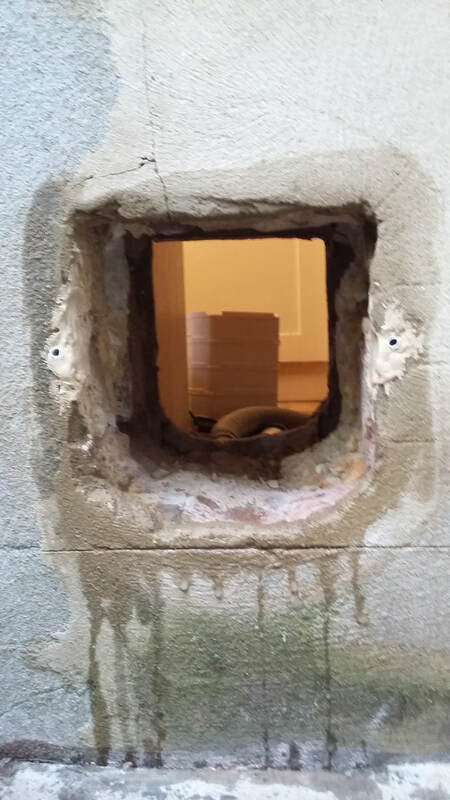 ...it's rather chilly with a big hole in the wall. 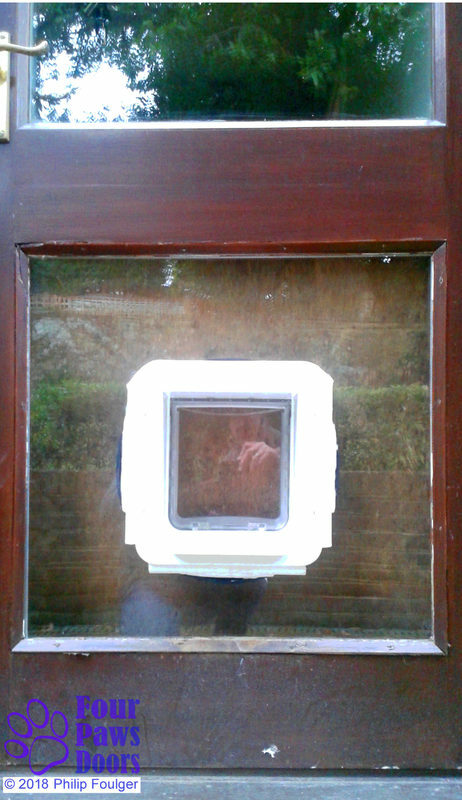 Silicone applied haphazardly where none required. 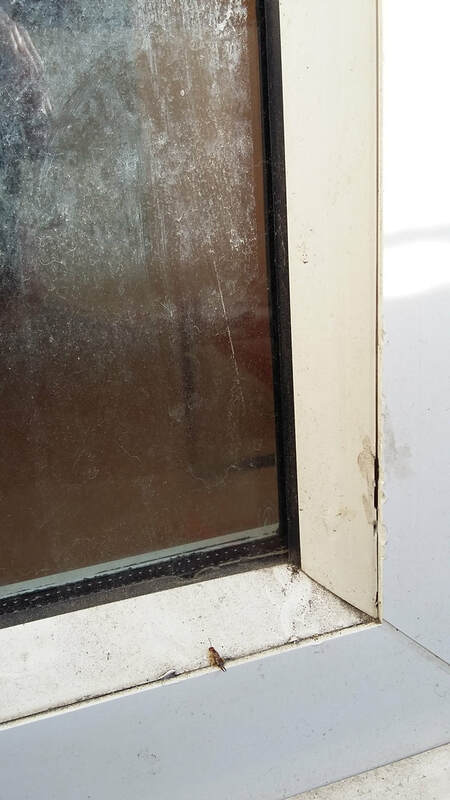 Careless removal of the plastic glazing beads resulted in damage to the beads. 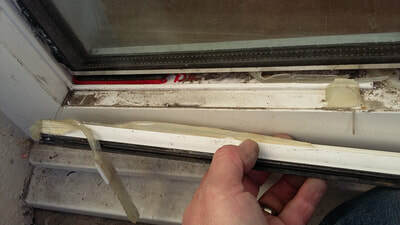 Silicone applied willy-nilly making it very difficult to remove the beads. 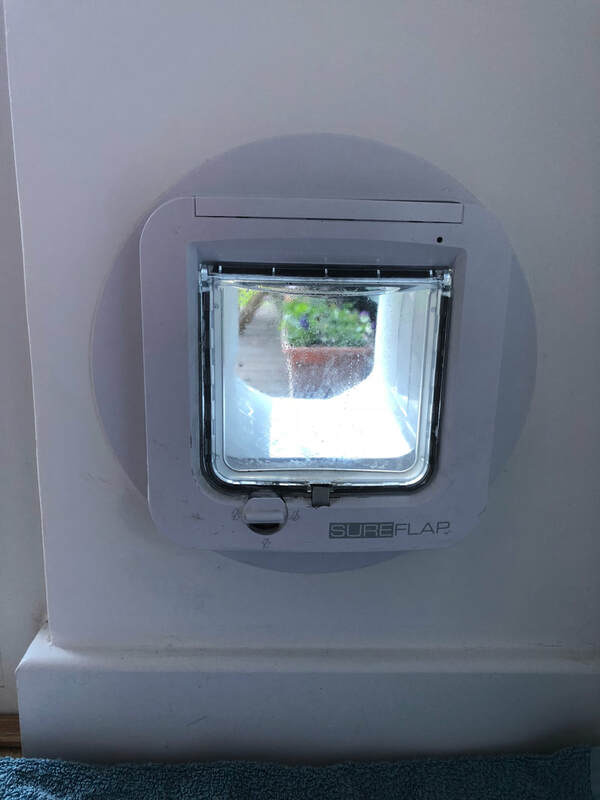 We have a cat flap already but it has broken and are looking to have a more stable tunnel put through the wall with a new microchip cat flap. 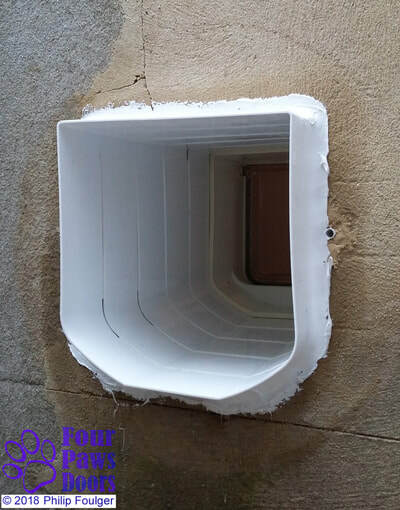 ... the tunnel dips in the wall and we want to try and make the tunnel more solid this time. 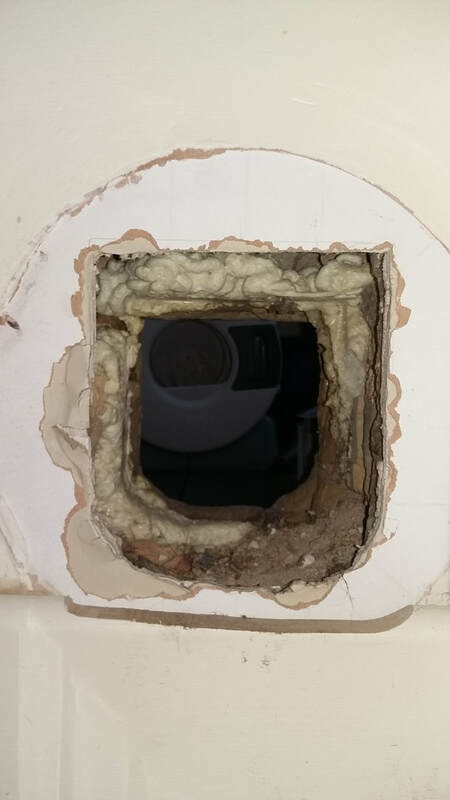 Gaping gaps filled with odd bits of beading and volumes of silicone! 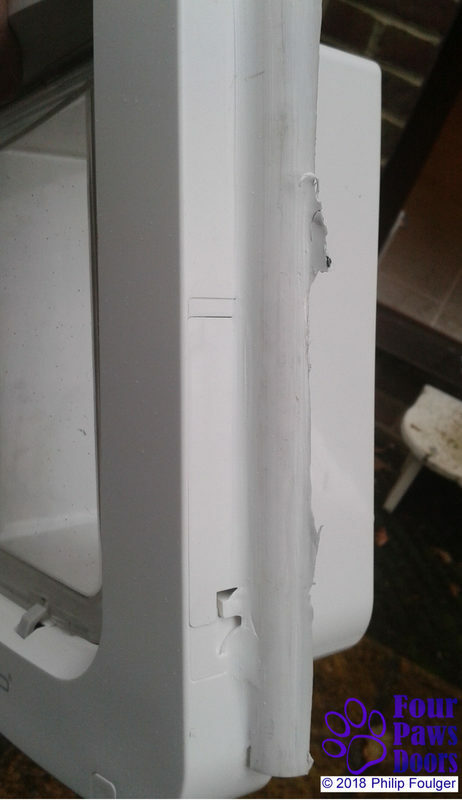 Battery compartments sealed behind bits of beading so batteries can't be replaced! 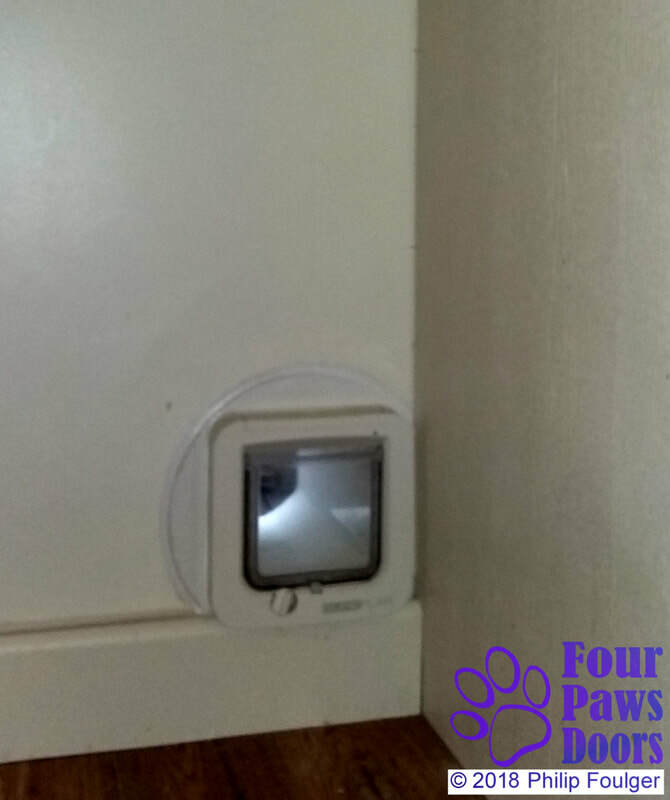 I cleaned up the Pet Door and installed it properly with a mounting adaptor. The batteries can now be replaced! 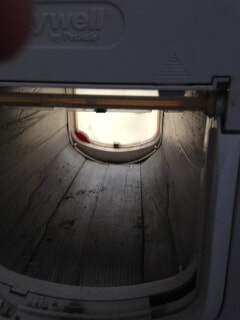 I also added an access step. 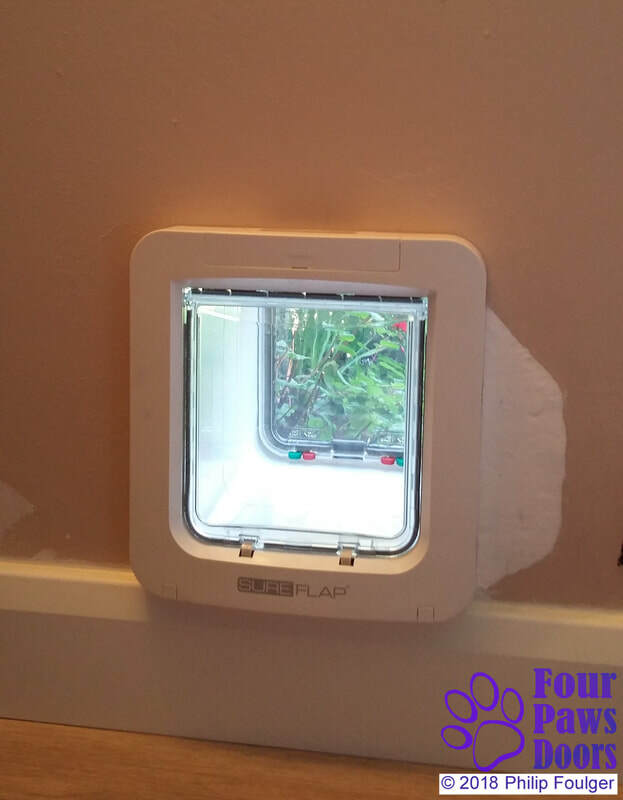 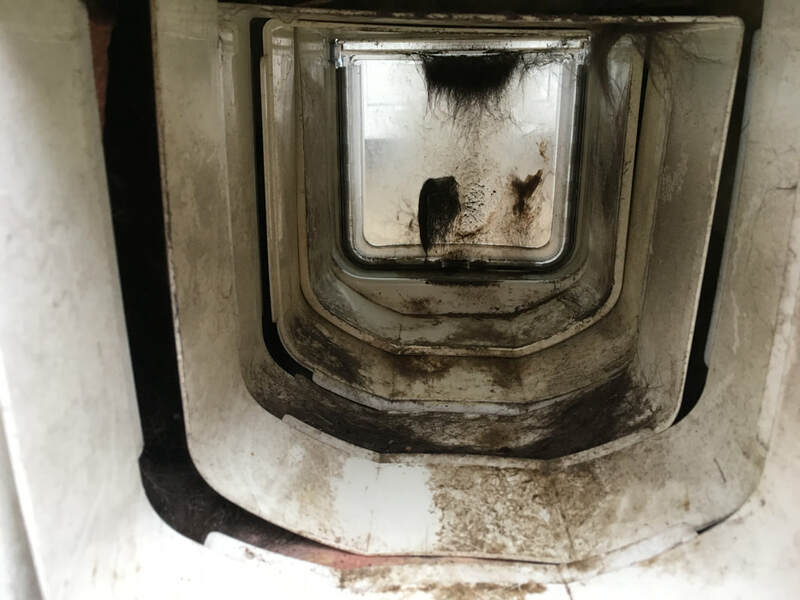 SureFlap Pet Door nightmare fitting! Need help urgently - thanks!